1. Put a zip tie around one of the stanchion tubes. 2. Sit on the bike in your normal riding posture. Ask a friend to hold you in place, and slide the zip tie as low as it can go on the stanchion tube. 3. Gently get off without exterting more pressure on the fork and handlebars. 4. Measure the distance between the zip tie and the bottom of the stanchion tube. 6. To increase this distance reduce the preload and vice versa. 1. Loosen the two allen bolts holding the brake assembly on the frame so that the assembly can move a few millemeters. 2. Press the brake lever completely. This centres the assembly on the brake disk. 3. While holding the brake lever all the way down tighten the two mounting screws. Tighten the two screws by about quarter turn alternately. Do not tighten one completely before tightening the other. 4. Ride around for about 50km to allow the brakes to wear in. Performance reaches its peak only after the discs have worn-in after about that much use. Setting up Derailers: Excellent tutorial here from pinkbikes.com. Update: See this post for more on Disc brake adjustment. Thank you for sharing this, I have brought the RR 5.3 home today and during the first ride, it seems the front disc was making some whistling/wheezing noise, tried taking the wheel OFF and ON with quick release just to see if a mis-alignment could have caused it! 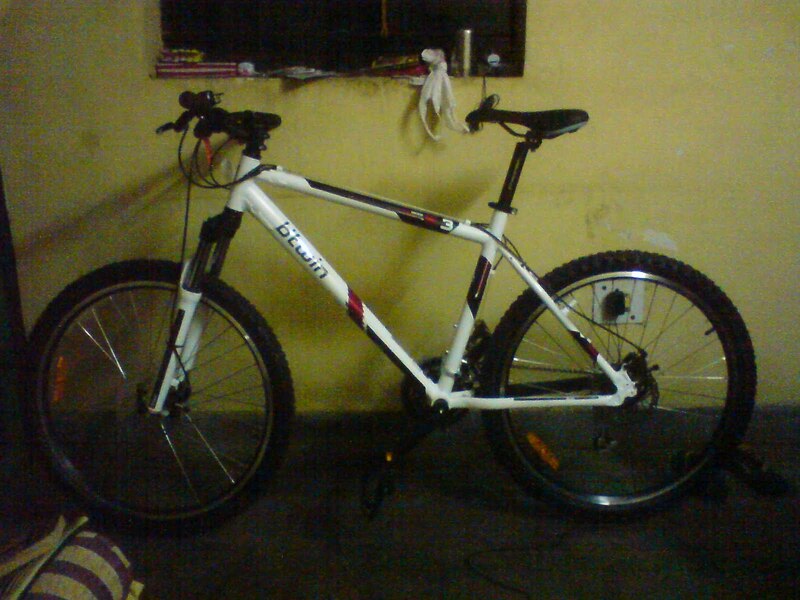 no luck so far, planning to take it to Decathlon service tomorrow to get it fixed. I guess I will keep coming back to your blog for great information that you have shared and more reviews on RR 5.3 :) Thanks for sharing.